Would you like to enhance your pout? Plump lips are all the rage, but maybe you feel like your lips simply can’t be plumped. Dr. Bunin is ready to give you the full mouth you’ve always wanted. Restylane® Silk can subtly add shape and volume to your lips without making you look like you got punched in the kisser. Restylane® Silk is a unique formulation of hyaluronic acid that helps maintain lip fullness for up to 6 months. Dr. Bunin is one of the first practices in the country to receive this new product. Restylane® Silk, Restylane®, and Restylane-L® are the first FDA approved products specifically for use in and around the lips. 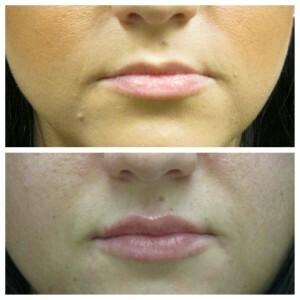 Even if you were born with thin lips, you can get the fuller lips you want by having Restylane® Silk injections. Dr. Lisa Bunin will carefully inject Restylane® Silk in one or more injection sites. Because Restylane® Silk contains lidocaine, discomfort is minimal – by the end of the treatment, wrinkles will be reduced by about 80 percent and your lips will appear fuller. Enjoy luscious lips with Restylane® Silk! How Long Does Restylane® Silk Last? The results are immediate and will last about 3-6 months. Additional treatments are necessary to keep your lips full and luscious. Restylane® Silk requires little to no downtime with most patients able to return to their daily activities immediately following the procedure. Bruising at the injection sites can be covered with mineral makeup. As with any injectable filler, you can expect mild swelling and reddening at the treatment site that will typically resolve in a week. The side effects of Restylane® Silk are common as with most other injectable treatments and include swelling, tenderness, bruising, pain at injection site, and redness. These side affects generally last for only a few days. Dr. Lisa Bunin was selected by Restylane to become trained and certified as a trainer in the injection of Restylane® Silk. As a certified trainer, she will be conducting trainings for other physicians in the special injection process of Restylane® Silk. The practice of Dr. Lisa S. Bunin is located in Allentown, PA and provides cosmetic services to patients from Bethlehem, Lehighton, Strousburg, Washington, Souderton, Warrington, Clinton and others.